There aren’t too many things on this European trip that I actually have planned on doing. Making a conscious effort of ensuring that it gets done. My approach to travel is much more on a whim, exploring the unknown and following what I desire when I see it. The Ciudad de las Artes y las Ciencas in Valencia was probably one of the few but ‘few‘ is the operative word and even the great traveler Mecca’s of the Eiffel Tower in Paris or the Barceloneta Beach in Barcelona weren’t placed in my essentials list. It’s not even a definitive list. Nowhere have I written a compilation of things to do or places to see so if you were to ask me to rattle off the contents I couldn’t. It’s more a conceptual thing and if I think really hard to what it contains then most of the items would be not specific landmarks or sites, but instead cities. For the city consists of more than just structures and nature – it plays host to it’s people and with it a feeling that is always unique from the last. It’s the cradle to a culture and experiencing and comparing these is what I enjoy. Accompanying the plethora of cities on my list would be a scattering of individual items. Placed there either for sentimental or historical value, they would be rare but they would nonetheless exist. Potentially the highest placed of these would be Le Tour de France, the most prestigious cycling race in the world. I never had much of an interest in “Le Tour” when I was younger and living in Australia. I didn’t have a passion for cycling and Australians never really had much success in the race anyway. I knew of it’s existence, but there wasn’t an interest. That is, until taking mathematics in my final year of secondary schooling. The teacher was a cyclist and, during the month of July, would always talk about the latest goings on in Le Tour. I decided to watch one night and immediately I was hooked. From then on, for the next six years I would stay up late most nights during July, switching between Wimbledon to Le Tour de France. I couldn’t watch an entire stage, but I was captivated when I was watching the race. Although, I was never really watching the race. I might tune into the news the following morning to see who had eventually won the stage to hear a name that was completely unfamiliar to me. I didn’t even know the riders. No, I was captivated by the locations that they were racing through. The footage of the French countryside from the helicopter flying above, often zooming in on some historic château or village. The great thing about the broadcast was that the commentators would talk about each village and discuss the people that may have come from there or the historical events that took place there. To me, the broadcast was more a lesson on France and it’s history and my adoration grew with each class that I took. It became one of the primary reasons that I pursued learning the French language and basing myself in France during my trip. The related item on my conceptual bucket list was to not just watch a stage of Le Tour, but to do it in one of those tiny villages that the riders weave in and out of along the route. So when Jean-Michel and Patricia told me that Le Tour regularly passes through Rousset-les-Vignes, it was as if fate had planned itself to perfection. While in Spain I contacted them to see if it were possible to stay with them for a few days during the race. They agreed and so my journey led me back to them. It was one of the rare times on my trip that I actually had a deadline. A place to be on a particular date. I much prefer to visit a city, get a feel for how long I want to stay, discover the place and then move on when I feel like it. This was a deadline I was looking forward to, however, but it was one of the reasons that I could only stay in Perpignan for the one night instead of longer as I would have liked. Julien wasn’t there this time. His work in Paris took precedence. I did this time, however, meet one of his sisters, Lucie. She was, much like the rest of her family, very friendly and accommodating, sharing discussions with me about travel and such. Rousset-les-Vignes doesn’t contain a lot of younger people as there aren’t a lot of career jobs there so it sometimes comes across as a sort of retirement village. So when I joined Jean-Michel and Patricia to a few parties that they had been invited to, I was thankful that Lucie was there and I had somebody with common interests to talk to. 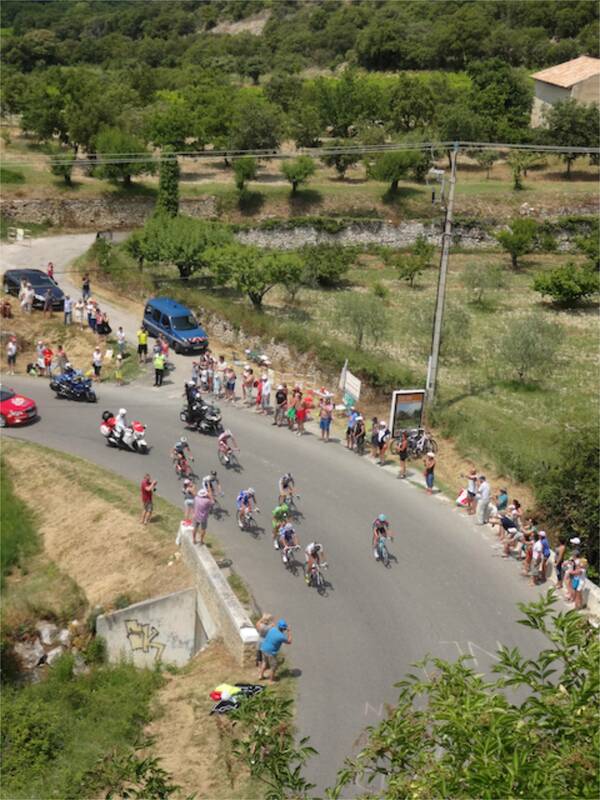 This year Le Tour was passing through Rousset-les-Vignes on the fourteenth of July. This is also the date of France’s national day. In English it’s called the Bastille Day, but they don’t call it that in France – it’s simply called “Le quatorze Juillet” (literal translation of ‘The fourteenth of July”). It marks the date of the storming of the Bastille, a key event in the French Revolution. What was interesting to observe were the priorities placed on the two events. Perhaps in Paris, the seat of power and the location of the former Bastille, the national celebrations were regarded as being more important. Indeed, there was a formal ceremony in Paris featuring a parade of many of the military divisions and it was broadcast live on national television. Perhaps in the rest of France it was placed with a higher importance too. Not here in Rousset-les-Vignes, however. There was a clear number one, and that was Le Tour. Most of the locals here have been through this all before – Le Tour passes through every third year or so and so they weren’t as excited as I. There were a lot of advertisements in the local newspapers ensuring that people knew exactly where and when Le Tour was expected to pass through. For Rousset-les-Vignes, it wasn’t expected to pass through until the afternoon, so we had some time to waste beforehand. How do you do that? Why, by watching Le Tour on television, of course! Jean-Michel and I watched the opening hour or so on the television before I followed Patricia into the town center to see what was happening. The normally dead quiet streets of the village were now active. They weren’t spilling over with excitement, but there was a feeling in the air. The hot summers day had allowed the town to set up a festive atmosphere in the central square where some wine tastings and a barbecue was happening. We enjoyed this atmosphere for a bit but eventually we had to fulfill our main mission – scope out a suitable spot to watch the race from. There were two candidates. One was on the main road, just across from where the barbecue was happening. This was in the heart of the village, surrounded by old buildings and the view would allow us to see the riders after coming out of a bend from where the church is and travel down our road for two hundred metres or so. This was my preference. It perfectly satisfied the visions that I had of watching Le Tour pass through tiny villages on the television all those years back. The alternative wasn’t bad though. Perched on the top of a hill looking out towards the direction that the riders would be coming from. You could see for what must have been a couple of kilometers and so gave the best value in terms of time to watch it. But here you weren’t right up against the road. You couldn’t get in the face of the riders whereas in the first location you could. Eventually we agreed on the best of both worlds. We would start at location number two, watch them approach and by the time they pass we would have approximately a minute or so to rush to location number two, where they would then pass again. First was the sponsors cavalcade though. 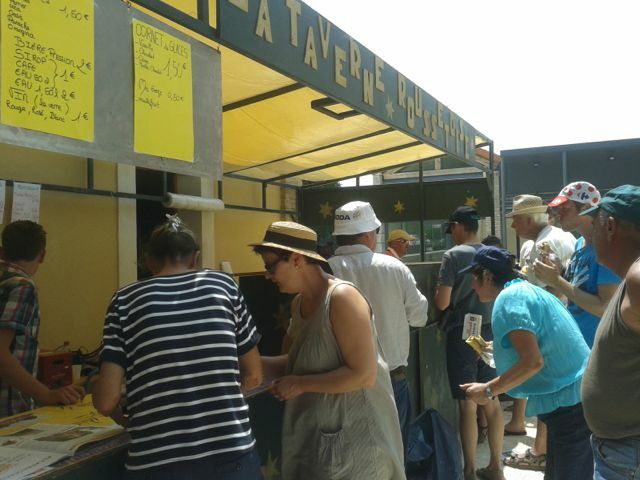 This is about an hour before the riders pass through and most sponsors of Le Tour have a car that drives past and throw out samples of their products. I found it a bit cheesy and far too commercial but the people here loved getting their hands on any free stuff they could get, even if they were useless items. I saw first hand grown men run across the road to get a wristband of some company. Lucie and I got next to nothing, though Jean-Michel and Patricia on the other side of the road manage to rack up a large collection of items. Finally, the time was approaching to watch the race. We returned back to the location on the hill overlooking the flatlands and waited. People perched alongside with binoculars and a few people with radios regularly gave updates of how long it was estimated until the leading group would arrive. Peering off into the distance I surveyed for any sign of a cyclist. Finally, they arrived, winding up the road ahead of us. The fans cheered and encouraged. Not for any particular rider, although I think there was one Frenchmen in the leading group at the time. It was more so encouragement to all the participants. The people here didn’t have a favourite or anyone that they wanted to see win. They just wanted to see an event. They wanted to see what they have for the past one hundred years continue. This was simply a sign of gratitude to the cyclists that make it possible. This portion was slightly uphill so the speed was not amazing but it was still an intense feeling to realise that one of my dreams was being fulfilled. They passed and it was time to quickly rush down to the second location to see the peloton pass by. We arrived in time, though at this stage the streets were lined with crowds that made it hard to find a good position. Remarkably we did. Directly along the roadside, and we (or, at least, I) waited with baited breath. The cheering of the crowds ahead of us was the indication that the cyclists were getting nearer, and eventually the team cars turned the corner and the peloton soon followed. Flags waved and people cheered. It was just like I had imagined after watching it on the television all those nights. You couldn’t wipe the smile from my face as I clapped the cyclists past. This time they were on a flat section of road and the speed now was quite impressive, particularly given the consideration that they had already completed around a hundred kilometers of racing before it. I could feel the wind brush past me as they flew past. If I reached out any further, I would probably knock one of them off their bikes. In reality, it all passed by in about twelve seconds. There were one or two that trailed about ten seconds later that got great encouragement from the crowd. It felt as though it went for longer though. It’s incredible the excitement that such a thing can generate simply because of it’s reputation and it’s sentimental value. And, in a blink of an eye. That was it. Almost immediately, the crowd dispersed and people moved on to whatever was next on the agenda. Le Tour was over, at least for another year. Weeks of buildup and hype had released itself into twenty-five or so seconds of intense joy. For the majority of French, this is Le Tour. Twenty-five seconds. I had planned the last three or so weeks of my trip to ensure that I came here to see twenty-five seconds of glory. And it was worth every one of them. Would I do it again? Perhaps not. I wouldn’t sacrifice discovering other things. But if I had the time and opportunity to do it, absolutely. Because in a way it was more than twenty-five seconds. 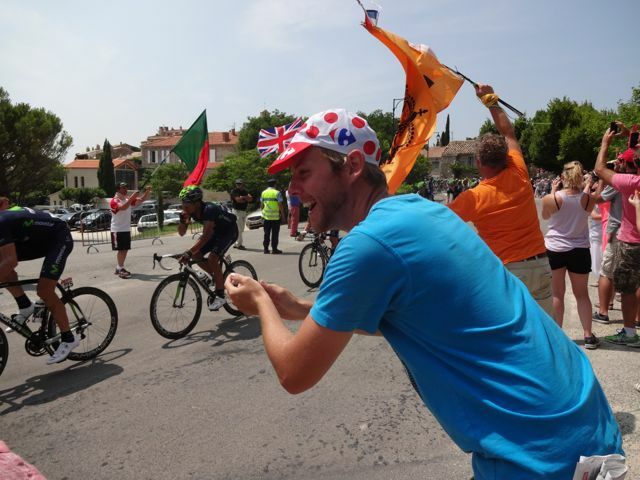 Le Tour had passed by Rousset-les-Vignes for the last two weeks or so, it had just manifested itself differently. Le Tour is not just merely a bunch of cyclists trying to outcompete one another. It’s something for the French people to talk about, to celebrate. It’s at least on par with Le 14 Juillet and it brings together the various villages scattered throughout the countryside. 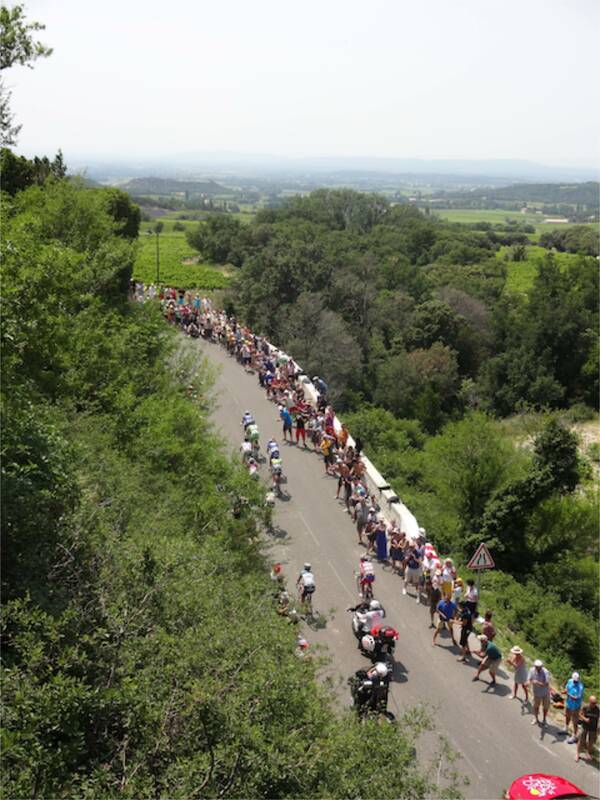 So here in Rousset-les-Vignes, just as when I watched on television all those late nights in Australia, I was never really watching the race, I was watching the people and the communities embrace the event, and the beautiful surrounds that it took place in. That was longer than twenty-five seconds. That was what I enjoyed.